NNVC is down this morning, over 10%, on no news and in front of an anticipated positive write-up from Breakthrough Technology Report. So much to sift through, so much to figure out.....maybe not. NNVC is up sharply from its most recent BUY SIGNALS on both the Daily and Weekly Models. Even with this morning's decline, this stock is up over 100% year-to-date. As long as the stock remains on the OTC Bulletin Board, expect the inexplicable. but why the drop? Is this called a correction? 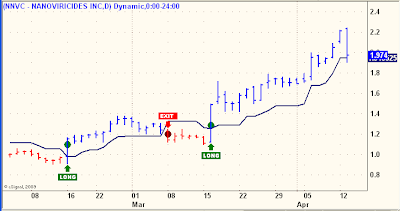 Do good traders take profit at 2.20 and buy back? Does this stock go back to 1.75 level? Do you advise your clients when to buy and when to sell? I appreciate your question, but there is no, "one size fits all" answer as to when to buy or sell a stock, every one is different and there are many considerations that have to be applied on a case by case basis. That said, I believe the above posted Trend Models offer a workable "BUY/HOLD/SELL" perspective that can be applied to most situations. Also remember that one day does not constitute a trend. 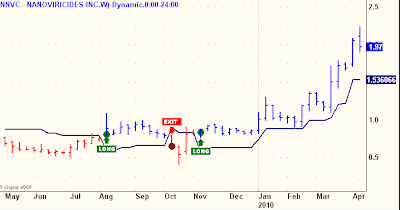 Up over 100% in a few months is not typical...a correction was/is overdue and healthy. I will buy and hold core holdings with a very long term perspective. Buying more when it corrects. If you do try the daily model. If you think they've got the real deal here (I do), buy and hold is the only way to ensure capturing all the long term gains. So the $4 by the end of the week prediction is off the table? Where did you read that NNVC was going to $4 by the end of the week? People thought your EW $.00 meant End of Week $4.00. Holy smokes, we have some serious new money in this thing. EW means Elliott Wave. Breakthrough Tech report on NNVC not coming out by the way. Nonsense, I've been using "EW" for "Elliott Wave" for five years and have never, ever, ever, given a one week price projection for NNVC or any other stock. 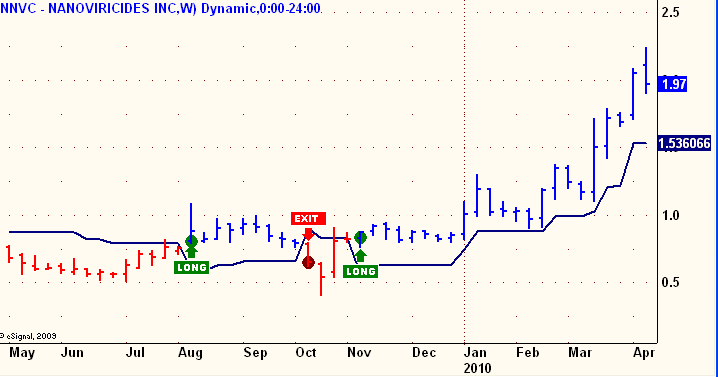 The only NNVC price projection involving time that I have ever published is my suggestion that NNVC could see triple digits by 2014.
maybe I shouldn't have said "people", I meant "that poster" thought EW was end of week. LOL. any one know why AVXL has appeared to stop trading at 11:47 this morning? Today was a bear raid by someone or some collection of players that want to get on board, but at a decent discount. Today was very reminiscent of the action on October 25th last year if memory serves.